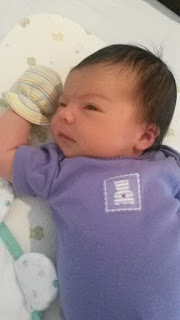 Ada was born at 2:30 in the morning on her due date, July 16th. I started having contractions around 11:30 and we barely made it to the hospital in time to start pushing. Luckily there isn't much traffic at midnight. We are thankful that it went quickly and she made it out healthy and happy. She came with a full head of dark hair and dark eyes at 8lbs 2oz and has been gaining weight like a champ. I lost a lot of blood in the process so we spent some extra hours in the hospital. They were super nice and helpful. Order the pot roast and sherbet. The last two weeks have been a whirlwind of learning and snuggling with occasional sleeping. She is so cute and fun it's usually hard to be unhappy about lack of sleep and poopy diapers. Matt goes back to work on Monday, so we'll have another change to adapt to but I'm sure we'll figure it out. Thanks for the love and well wishes!